Tailgater by Flat Tail is a 5% ABV German Kölsch. Tailgating doesn’t have to mean crap beer, and the good stuff shouldn’t have to come with directions. Rich German Pilsner malt, a hint Noble hops, and the kind of brilliant yet unfiltered clarity that only comes with time . So, lock those hubs, drop that tailgate, and pop that top with your pinky up. After all, this isn’t your Grandpa’s fizzy yellow beer. Got this one as a freebie from CraftsShack.com for ordering some good beers. Looks like being a good customer pays off after a while. Thanks for the freebie guys! Also, instead of just drinking this off, I decided, what the hey, we don’t get this one locally, Review time! Technically, this would be my second Flat Tail Brewing beer, where the Cyanide and Hoppiness was the first. I don’t think I have tried the actual Kölsch style before in a review or ever really. I heard it is really light and easy to drink and from I can tell so far in appearance, it surely is looking that way. So let’s give this one a shot shall we? Citrus, honey, cane sugar notes, phenolic bready hints, hints of clove spice, lemon, green apples, Stone fruit peach hints, pilsner malt, lyche fruit, piney hop hints, biscuit bread and cereal grains. Citrus, Stone fruit peaches, light apricots, pilsnery malt, biscuit bread, cereal grain hints, orange notes, lychee, piney hints, honey, cane sugar notes, phenolic bready hints, hints of clove spice, lemon, green apples and honey dew melon. Finishin dry with minor notes of the stone fruit and citrus. No alcohol in the taste, clear straw colored light body, crisp, clean and refreshing and easy to drink. Amazing, such a light body and great summer beer. I did not know what to think of this one coming into it but the more I drank it the more I like it. Like the very definition of summer with nothing too over powering and yet so refreshing and delicious. Makes me want to take a look at the Kölsch style more and more to see what great things it has. 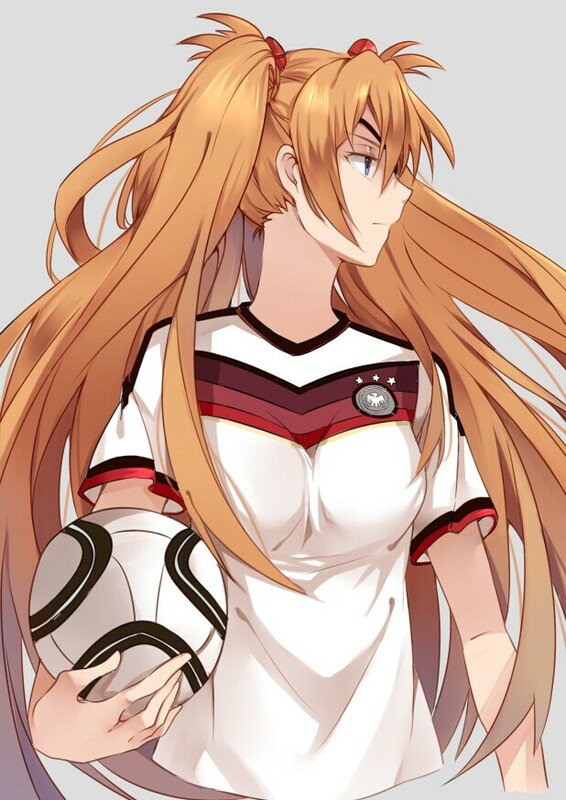 Asuka Langley Shikinami/Sohryu from Neon Genesis Evangelion was used in this pairing to go with the whole Tailgating theme but the actual Tailgating done by Germans. In this case, Germans would typically go tailgating for a Football/Soccer game and not American Football. Regardless of what sport is being tailgated, this beer fits right in. 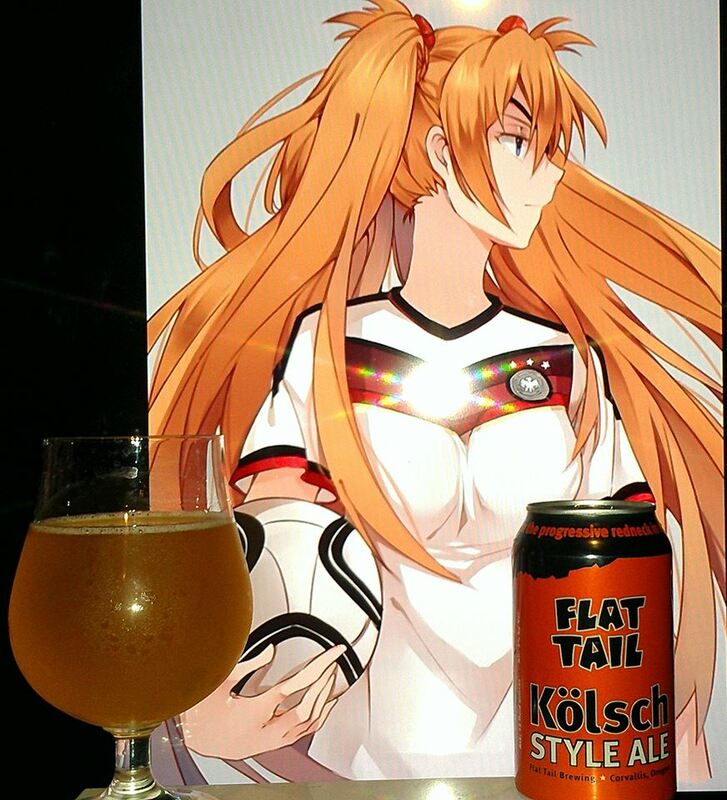 But because it is a German Kölsch, Asuka, being half German and representing the German National team, was definitely the Goal!